UNVEILING THE MYSTERY (OCCULT NUMBEROLOGY) | Watchman - Declare What You See! Considering, once again, all the things surrounding Super Bowl XLV and the 100th Birthday Celebration of Ronald Reagan happening on the same date, other things came into focus that I had not seen previously. Cloning is not something in the future, it’s here right now – including the ability to clone a human being! These “human clones”, according to some “Military sources” can reach full maturity in 6-12 months! Since this has been addressed in detail in previous articles, I will not get back into all that information in this article, but simply attempt to explain how the things already revealed might well come together in the time periods to be discussed. In the article entitled, 911 The Mystery Decoded 1911, (August 2009) information was provided that the Lord Jesus Christ was born on 911 in 3 B. C. as research seems to prove. I’m not stating that this is either right or wrong, only that you consider the evidence especially in respect to what I’m about to reveal in this article. For a better understanding, please read that article again even if you’ve already read it previously. Satan attempts to “imitate” God since he wants to be “as God”, and he may be doing so once again in his planned introduction of the Son of Perdition to the world. Here’s an explanation of what “fractal time” involves so you get an understanding of what the following charts represent. 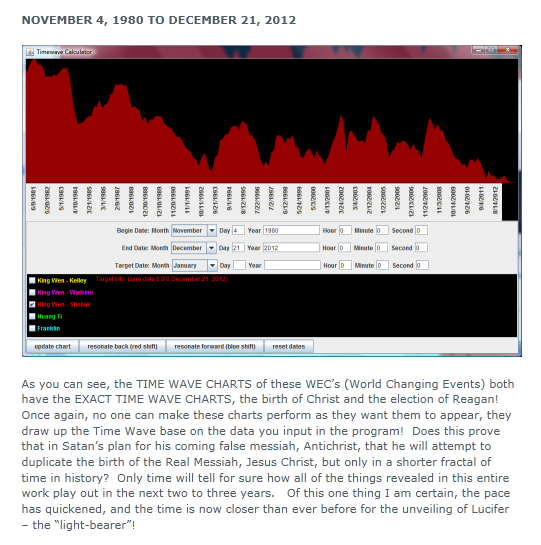 Here’s the site that allows for various calculations of “fractal time” which I utilized to arrive at the following charts for comparison. The following charts and information were taken from the August 2009 article mentioned above to serve as a reference for what’s to be presented in this article. 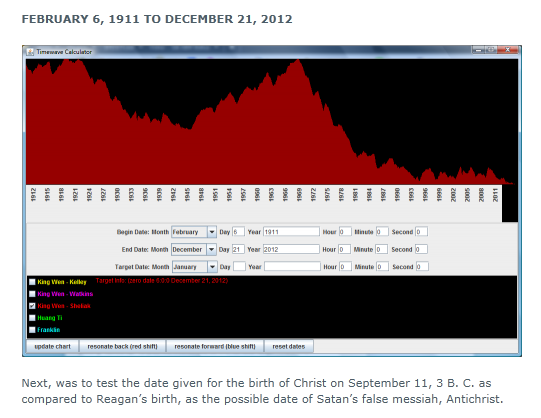 Ronald Reagan was born in the year of 1911 which has 911 in the date and is a possible imitation of Christ’s birthday. In thinking about 911 and all the Occult (hidden) meaning in this number and the effect on America and the entire world since 9/11/2001, I decided to explore a bit. Here’s what I discovered during this exploration. Or 90 years excluding the end date. Or 90 years, 7 months, 5 days excluding the end date. The numbers, 33 and 9, are found in the time (33,090 days) from the birth of Reagan to an event that changed America and our way of life forever! Was RE – agan’s birth notable in any other manner that might imitate the birth of Christ? As we approach Super Bowl XVL and Reagan’s 100th Year Birthday Celebration on the very same day, the following facts are worthy of consideration. By adding 1200 months to Reagan’s date of birth you will arrive at his 100th birthday on 2/6/2011. What’s in the number 1200? Twelve is the number associated with God’s Divine Government in Scripture, and 1200 in the Sumerian Code implies this very fact! Is Satan attempting to imitate the government of God? In the very first article of The Lucifer Project – Raising Antichrist, (Part I), here’s a copy of what was posted in that article. While these numbers have been fully explained in several articles, the ones that really need further discussion, in light of what I discovered in my exploration since my last posting, are 1111 and 1212. Let’s see how. First the number 1111, as stated above, appears to be the time when some kind of “Cosmic Portal”, “Star-gate”, or “Doorway” is opened. Perhaps the Bottomless Pit! It may well be that the 1111 event takes place prior to 12/21/2012, and that the Mayan End Date is foretelling the arrival of planet X! The number 1111 is thought by many to represent the opening of this Cosmic Portal, and that may well be the correct assumption! Consider the following facts: Ronald Reagan’s birth day is 2/6/1911, and his 100th birthday celebration is on 2/6/2011. What’s so special about that? If written normally before the year 2000, the date was almost always written as 2/6/11 for Reagan’s birthday. From the year 2000 on we have to include the Century number as well to distinguish as to what Century we are talking about. For example, the Old World, before the year 2000, most of the time did not include the Century, but the year 2000 changed all that. If we only wrote Reagan’s birthday as 2/6/11, how would you know what Century he was born in? 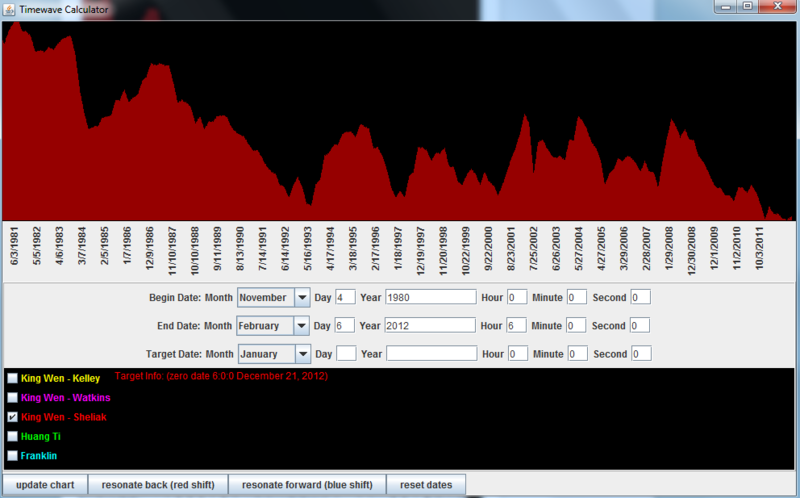 We have come full circle from 2/6/11 (1911) to 2/6/11 (2011) with a 100 year period of time between 2/6/11 and 2/6/11! This is another incidence of the number, 1111, coming into the picture. Stan Deyo well might refer to this as a Cosmic Conspiracy! While we may or may not experience anything on Super Bowl Sunday, 2/6/2011, that we can see in the “physical world”, something is clearly at play in the supernatural. Will the DNA of Reagan be implanted in human flesh on his upcoming 100th birthday celebration to produce a fully mature “clone” in 12 months? Perhaps this has already been accomplished, and this year-long birthday celebration will just be hailed as a predetermined “Celebration” of what has already taken place! The only other person I know of in all of history whose birthday is celebrated among His followers throughout the entire year is Jesus Christ! Not only is the number 1111 visible in the above dates, but consider this as well. In Occult numerology, the dates of 2/6/11 (Reagan’s birthday) can be decoded as follows: 2 x 6 = 12 and 1 + 9 + 1 + 1 = 12 (1212)! 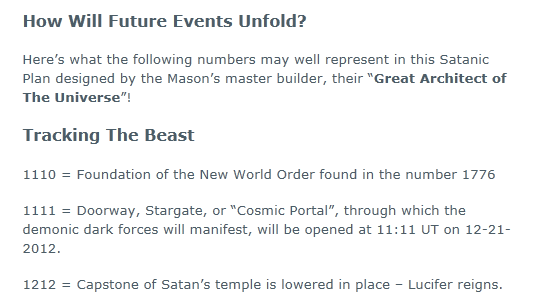 We have looked at the numbers 1110 and 1111 in the above chart with the numbers 1110, 1111, and 1212 being found in (Part I) of The Lucifer Project – Raising Antichrist. Let’s turn our attention to the number 1212 once again in the order of things. From Reagan’s birthday to his 101st Birthday Celebration in 2012 is exactly 1212 months! 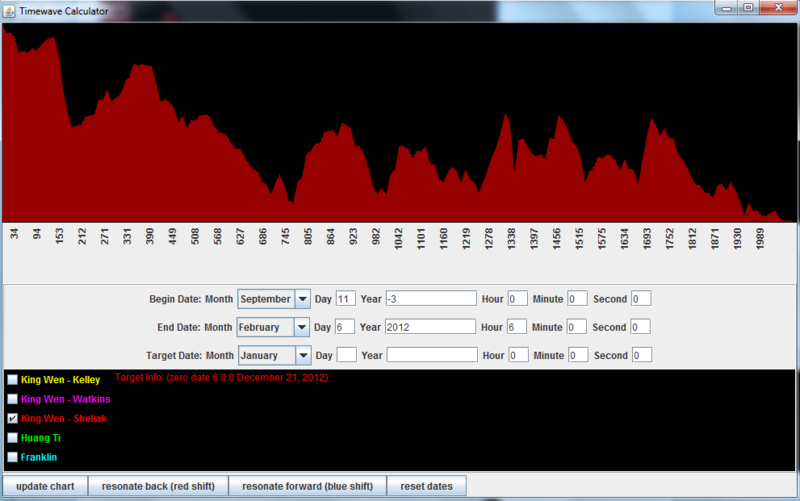 Will 2/6/12 (2012) (2 x 6 = 12; the year 12) (1212) be the date of the “coming out” of the Son of Perdition? Will all Hell from the Bottomless Pit be loosed upon the earth on 2/6/12 (2012)? Perhaps the time is closer than most have considered while being focused on, 12/21/2012, the Mayan End Date calendar! The above number 222 can also be decoded as: (2 x 2 x 2 = 8) the number associated with New Beginnings! Perhaps this is the The Time (Dirty Bit) as the Black Eyed Peas stated in their song on the album entitled, The Beginning! 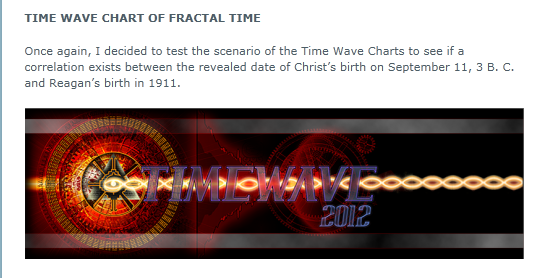 Looking once again at the TimeWave charts for signs of confirmation that the above information could be correct, that is, that the time wave from 2/6/1911 to 2/6/2012 might indicate a repeated pattern of “fractal time” as occurred from the previously stated birth of Christ on 9/11 in 3 B. C. to 2/6/2012, here are the results displayed in the following charts of those periods of time. Amazingly, they are exactly the same even though there is over 1911 years difference in the span of time between to the two time periods! 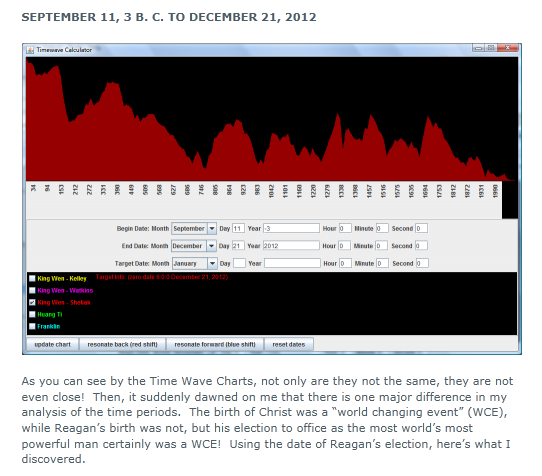 In simple language, the Fractal Time shown in these charts indicate that from the birth of the Messiah, Jesus Christ, to 2/6/2012, and from Reagan’s first election as U. S. President on November 4, 1980 (possible Anti-Messiah – DNA clone) to 2/6/2012, appears to indicate in Fractal Time that the birth of a “Messiah” is repeating once again in history. Only this “Messiah” will not be the coming Messiah of the Bible, but what Christians would proclaim as the Anti-Messiah or the Antichrist! A “clone” produced from DNA used to produce the False Messiah would serve as Satan’s Counterfeit of the virgin birth of Jesus Christ if a virgin were used as the “vessel” into which the “corrupted DNA cell” were inseminated. As we’ve mentioned before, the ability to “clone humans” would also be a counterfeit offer of Eternal Life which is available only through Jesus Christ our Lord and Savior! When did the “implanting of seed” into a woman to produce a child begin in written history? The numbers 1110 (NWO) and 666 (Mark of the Beast) added together form 1776 as shown in detail in Part I of The Lucifer Project – Raising Antichrist. Has artificial insemination come full circle in our day with the “cloning” of animals and humans along with a “mixture” of each? If you have followed Tom Horn’s research on Genetic Manipulation, you’ll have no trouble following the logic or the possibility that human clones are most likely already walking among us! In an unprecedented move, the State of Illinois, Reagan’s place of birth, passed a bill to raise the state income tax by 66%! What does this have to do with the topic at hand? 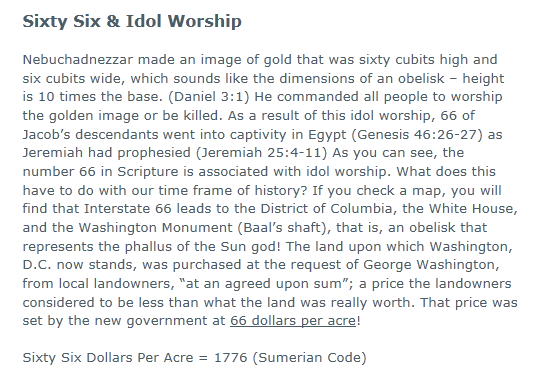 If you recall, 66 is the number associated with IDOL WORSHIP in Scripture, and the coming Antichrist will demand to be worshiped as God alone with his “image”! The following was taken from The Lucifer Project – Raising Antichrist (Part I). While the Antichrist spirit has been around for thousands of years, the display of it in mundane day-to-day events seems to be everywhere. Bill Clinton gives a hug to Rahm Emanuel as shown in the above news article, or in the one below, while Clinton supports him in the race for Governor of Illinois. Rahm Emanuel is infamous for his FOUL LANGUAGE in conversations and in his dealings with people; so when Jeanne posted the following in one of her comments to one of my articles, I wasn’t the least surprised to find the number of his name implying the presence of an Antichrist spirit. Rahm Emanuel is Jewish, but he is certainly not the Emmanuel of the Bible by any measure! Will the issuance of the Ronald Reagan Presidential Coin be the FINAL COIN issued by the U. S. Mint in this series honoring America’s Presidents? The following article from Wikipedia explains that scenario in detail. From the year that the Presidential Coin program started in 2007 to the year of 2016 is 9 years! From my study of Bible prophecy concerning the reign of the Beast and Daniel’s Seventy Weeks, the year, 2016, might well be the year in which the 3 1/2 year Great Tribulation comes to an end! Hello Gary. I hope you are doing well. I read the article on Super Bowl 45. Thanks for the heads up. So much symbology that the average John Doe couldn’t begin to understand. It reminded me of the 1976 movie Black Sunday. Take a look. Is Hollywood trying to tell us something? Makes you wonder. Thought I’d add to your numerology. Did you know that if you take the last two digits of the year you were born and add it to your current age, it equals 111. Does not matter who you are. It’s the same number for everyone. God bless and keep you safe my brother in Christ. Your are very welcome! As to anyone’s current age being added to the last two digits of the year in which they were born always adding to the number 111, that is indeed an amazing fact! Adding one’s age to the last two digits of one’s year of birth certainly works, but only if you add the age you will be on your birthday in the current year. For example, if your were born on 3/15/50, then you would still be age 60 until, 3/15/2011, and then at the actual time of birth you would then be age 61. (50 + 60 = 110; 50 + 61 = 111). So the formula should be started: “If you add the last two digits of the year in which you were born to the age your will be on your birthday in the current year, it will always equal 111.” Appreicate you comments and insight! Good to be back. Re-reading this because of your recommendation on Nov. 8th. I am glad to see you are still on the wall, seeing ahead for us what the Lord would have us understand and know. Be safe, you and yours….I continue to pray for your well-being. Thank you for your concern and prayers!